17477 EA ANDORRA (1966a) Chairlift*. Beautifully hand-colored die proof signed by the engraver COMBET. Scott No 169, Yvert No 175. Stunning and unique! 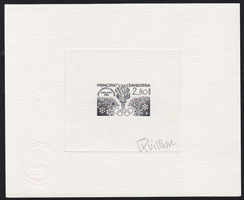 17384 EA ANDORRA (1970) Shot put*. Die proof in brown signed by the engraver BETEMPS. 1st European Junior Athletic Championships. Scott No 198, Yvert No 205. Attractive! 9179 EA ANDORRA (1976) Wool workers. 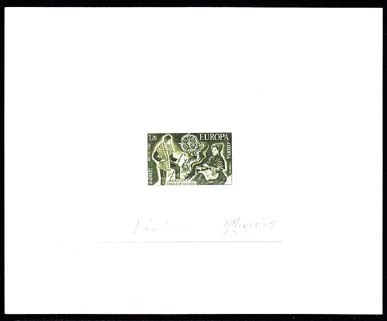 Die proof in dark green signed by the artist LAMBERT and the engraver MONVOISIN. Europa series. Scott No 247, Yvert No 254. 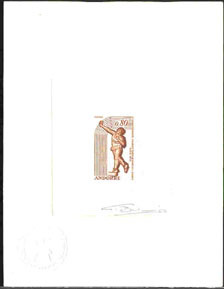 10439 EA ANDORRA (1976) Catalan forge. 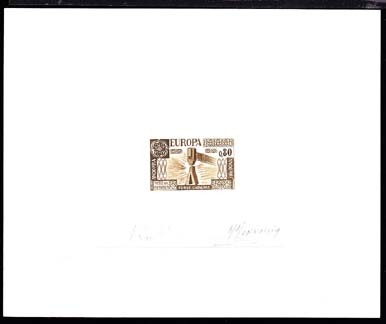 Die proof in dark brown signed by the artist LAMBERT and the engraver MONVOISIN. Europa series. Scott No 246, Yvert No 253. 11708 EA ANDORRA (1982) Scots pine. 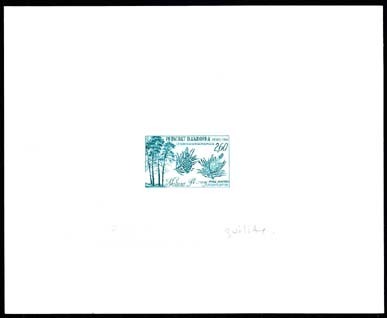 Die proof in greenish-blue signed by the artist LAMBERT and the engraver GUILLAUME. Nature protection series. Scott No 301, Yvert No 307. 11709 EA ANDORRA (1983) Birch trees. 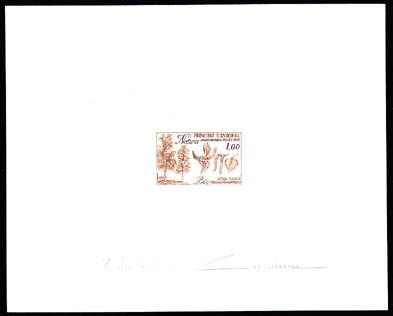 Die proof in brown signed by the artist LAMBERT and the engraver ALBUISSON. Nature protection series. Scott No 305, Yvert No 311. 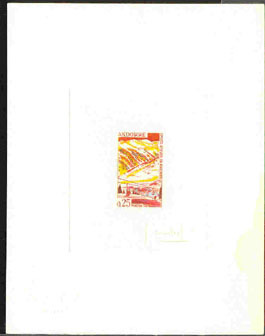 11479 EA ANDORRA (1984) Olympic torch*. Snowflakes*. Die proof in black signed by the engraver QUILLIVIC. Scott No 321, Yvert No 327. Sarajevo Olympics. 10474 EA ANDORRA (1989) Scene from Salome. 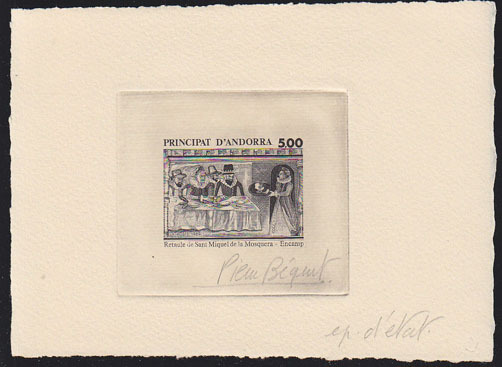 Stage die proof in black signed by the engraver BEQUET. Scott No 378.